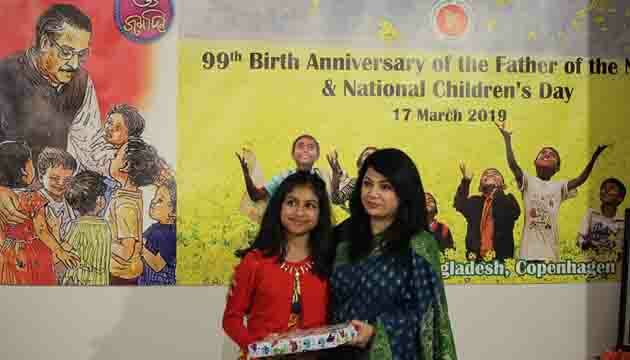 Bangladesh Embassy in Copenhagen celebrated the 99th Birth Anniversary of the Father of the Nation Bangabandhu Sheikh Mujibur Rahman and the National Children`s Day with great enthusiasm and fervour. 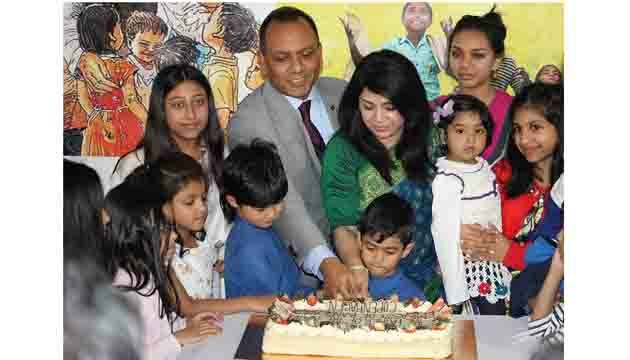 With the participation of more than one hundred members of expatriate community and their children, the Embassy turned out to be a festive venue celebrating the birthday of the greatest Bangaalee of all time and the founder of independent Bangladesh. The day-long programme started with hoisting of the national flag at the Chancery by Bangladesh Ambassador to Denmark Muhammad A. Muhith in presence of the Embassy officials. The afternoon event began with placing of floral wreath at the portrait of Bangbandhu by the Embassy family led by the Ambassador. 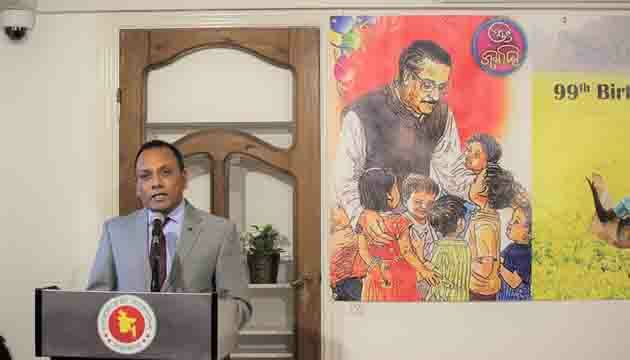 The main event of the day was a painting exhibition on the theme ‘Bangabandhu and Bangladesh’ as organised by the Embassy at the Chancery Auditorium which was zealously participated by the children of three age groups from the Bangladesh diaspora living in Denmark. This was followed by offering of munajat, cutting of birthday cake, reading out of the messages released on this occasion by the Honb’le President, the Hon`ble Prime Minister and the Hon`ble Foreign Minister and the Hon’ble State Minister for Foreign Affairs. All children participated at the event were awarded with beautiful prizes handed out by Mrs. Ruby Parveen, the lady wife of the Ambassador. 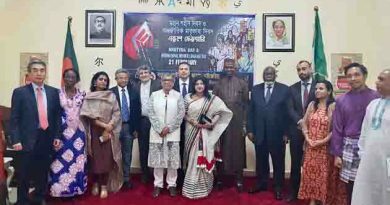 A documentary on the life and work of the Father of the Nation entitled “Bangabandhu: Our Great Leader’’ was also screened. 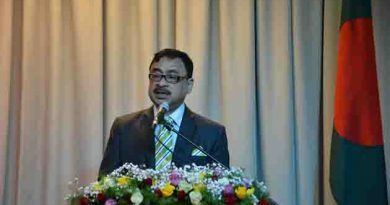 Bangladesh Ambassador Muhammad Abdul Muhith, in his speech, paid deep tributes to the memory of the Father of the Nation and highlighted on the struggle and sacrifices spanning his whole life in translating Bangalees’ long-cherished dream of nationhood into a reality. He emphasized on the fact that Bangabandhu and the history of Bangladesh are synonymous to each other and the new generation must learn more about Bangbandhu without whose epic leadership Bangladesh would not have become an independent country. He urged them to follow and practice Bangbandhu’s ideology in their lives which has been a beacon for our journey towards a secular, democratic and prosperous Bangladesh. 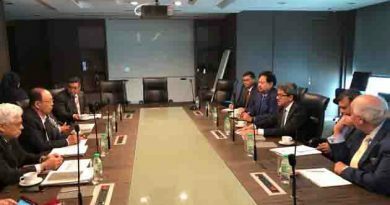 He deeply appreciated the participation of so many children in the programme who will lead the nation in its quest to realizing the dream of Bangabandhu’s ‘Sonar Bangla’ under the leadership of his daughter Prime Minister Sheikh Hasina. The programme was rounded off by serving children friendly foods which the children thoroughly enjoyed. 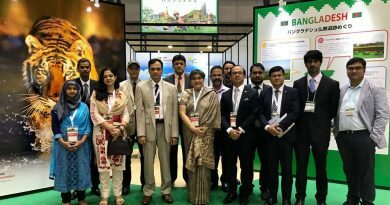 Bangladesh takes part at the Tourism EXPO Japan-2018.